Metro strives to ensure that its services (including over 200 bus and rail routes) are fully accessible to all of our customers, including those with disabilities. Metro is also the primary funding source for Access Services, the federally-required ADA paratransit service provider for Los Angeles County. This service is offered to individuals whose disabilities prevent them from independently using regular bus or rail service. It is comparable to fixed-route service and offers curb-to curb service during hours when local bus service is provided. For more information, please call Access Services Incorporated at 1.800.827.0829. 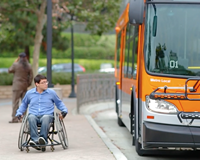 A new set of videos has been created to provide customers with disabilities some examples of transit service and features that can be expected when traveling on Metro. In addition to educating the riding public about accessibility features on Metro bus and Metro Rail, the videos are designed to encourage individuals with disabilities to view public transit as a safe and comfortable option to meet their travel needs. The videos are available on DVD. If you would like to request a copy be sent to you or your organization, please contact us via email at accessibility@metro.net, by telephone at 213-922-6919, or by mail at One Gateway Plaza, MS 99-21-5, Los Angeles, CA, 90012. Please make sure to provide your mailing address. Below are some video samples. The Metro Customer Code of Conduct (English) (Spanish) provides that Metro may allow the reasonable modification of our policies to accommodate the special needs of persons with disabilities in order to allow them to fully utilize our services. Whenever possible a request for a reasonable modification or accommodation shall be filed in advance to the Manager of Accessibility and Paratransit by email at accessibility@metro.net, by telephone at 213-922-6919, or by mail at One Gateway Plaza, MS 99-21-5, Los Angeles, CA, 90012. Requests for reasonable modifications or accommodations will not be approved if the request would: fundamentally alter the nature of the service, program, or activity; create a direct threat to the health or safety of others; result in an undue financial and administrative burden; or the individual would still be able to fully use the services provided by Metro without the modification. Individuals with disabilities may file complaints regarding reasonable modification or accommodation with Metro Customer Relations by telephone at 1.800.464.2111 or via email at customerrelations@metro.net. For questions on this policy, please see the Reasonable Modification Frequently Asked Questions. To make a request, please use the, Reasonable Accommodation Request form. Get customized itineraries 24 hours a day for all carriers in LA County using the Metro Trip Planner. Timetables for individual lines are also available online. You can also call Metro Customer Relations for trip planning assistance. Tell the customer representative your starting point, your destination, and the time and day you want to travel. You’ll find out what bus or rail line to take and where to catch it. Call 323.GO.METRO. Our representatives can mail you a timetable listing the hours of service for your bus or rail line. For a complete list of Metro fares, go to metro.net/fares. Metro's Reduced Fare Program enables eligible riders to obtain special LACTOA/Disabled TAP cards that can be loaded with reduced rate fares. Applications for LACTOA/Disabled TAP cards are available at Metro Customer Centers and in the TAP Users Guide for Riders with Disabilities. Applications are available in English and Spanish. You will need proof of eligibility or a Medicare card. Completed applications must be accompanied by a photo, required documentation, and a $2 processing fee. When completed, applications can be mailed to Metro’s Reduced Fare Office, submitted at any Customer Center, or mailed to the TAP Service Center as specified on each application. Once you have your card, you can load it with stored value or load it with a pass at Metro Customer Centers, at Metro Rail or Metro Orange Line TAP vending machines, online at taptogo.net, or at hundreds of neighborhood outlets. All Metro Rail lines are accessible to persons in wheelchairs. Every station has either a walkway/ramp or elevator from the street to the platform. In the event of an elevator outage at your station, you may take a bus to the next station for free. 1. Boarding and exiting the train – It's recommended, but not required, that persons in wheelchairs back into and out of rail cars to avoid problems with the gap between the platform and the rail car. Each rail car can accommodate two to four wheelchairs. The door nearest the designated wheelchair location is marked with the wheelchair symbol. If you cannot use the designated wheelchair area, avoid blocking the doors or the train operator’s cab door. 2. Securement on the train – There are no securement devices on rail cars. Passengers using mobility devices should use one of the handholds inside the rail cars and set the brakes or turn off the power on their chairs while riding Metro Rail. 3. Turnstiles – Many station entrances have turnstiles for validating TAP cards. Please use the entrance designed for persons with disabilities, located on the left and marked with the wheelchair symbol. If you're unable to tap your card at the turnstile, please use the hands-free intercom (see below). A valid TAP card is required at turnstiles, including wheelchair-accessible gates. Riders who need assistance can use the hands-free intercom. Approach the intercom near the turnstiles; a red light will come on when the hands-free sensor detects you. An attendant's voice will come through the speaker and an amber light will turn on. Speak to attendant to confirm you require assistance or wait for the next light. When a green light turns on, proceed to the wheelchair-accessible gate and the attendant will remotely open it for you. Braille and tactile signs that identify the station are posted at station entrances. Additional signs are posted in all subway stations on the sides of stairs and escalators near the platform to indicate the direction the train is traveling. Take care when approaching the edge of the platform. Textured flooring is installed on all platform edges to alert passengers with visual impairments. In addition, flexible yellow warning poles are installed on platforms to block the gaps between the rail cars when trains are in the station. Metro buses can accommodate all types of wheelchairs, including three-wheel scooter-chairs, power chairs and small four-wheel chairs. The general requirement is that the mobility device must fit on the ramp and be able to maneuver to the wheelchair securement area. 1. Boarding the bus – Bus operators will offer to assist each passenger using a mobility device in boarding the bus, reaching the securement area and securing the chair. Be aware of items hanging outside of the chair (bags, backpacks, baskets or other items) and make sure they are not in the way while boarding. 2. 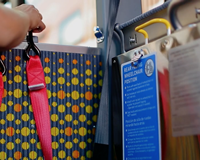 Securement on the bus – Metro uses a strap system mounted on the floor that can secure a variety of mobility devices. 3. Securement strap program – Metro offers free expert pre-marking of tie-down locations on mobility devices and securement straps for securement points. Both enable faster securement and release aboard buses. For the free pre-marking or installation of securement straps, contact 213.922.8800. See the Securement Straps for Mobility Devices brochure for complete details. 4. Securement areas – Metro policy requires that the operator ask other passengers sitting in the wheelchair securement area to move when a wheelchair passenger boards. The operator will request other passengers to give up their seats, but cannot force them to move. 5. Mechanical failures – In the event there is a problem with the ramp on a bus, the operator will contact Bus Operations Control for a supervisor’s response, or another bus to assist the patron using the mobility device. On most Metro routes, another bus with an operating ramp will arrive at the stop in less than 30 minutes. All Metro buses have automated annunciation systems that announce all upcoming bus stops. These announcements can be heard inside and outside the bus. For bus lines serving stops with multiple destinations, the annunciation systems will announce the bus line number and destination. Metro’s Accessibility Advisory Committee (AAC) meets on the second Thursday of the following months: February, March, May, June, August, September, November, and December in the Union Station Conference Room, 3rd floor in the Metro Headquarters in downtown Los Angeles. Live captioning is provided at every meeting. AAC agendas are available in alternative formats upon request. Please call (213) 922-6919 to request accommodations.